Chi is always soooo cute!! I love her clothes! great, awesome scan! This is a very beautiful image ^____^ I love CLAMP's customes Thanks for sharing it with us!!! I love this picie and i will add it to my favs oke? 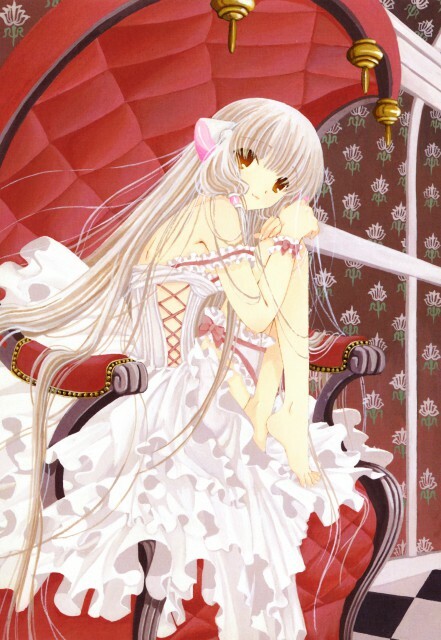 beautiful scan of chii :D she has always so wonderful and elegant dresses ^_^ she is like a princess in that chair ! red colour is nice and it fits nicely with chii's white dress :) thansk for sharing this pretty scan ! Ahh...! Gorgeous scan of Chii. I love the background colors and her dress ^.^ She is always so adorable! aww what a cute picture! another one from marissa too! nice scan i really like the colors in it too lol and the title fits perfectly lol! well keep up the awesome work! What acute picture this one! Wow again a lovely pic from Chi^^! Very nice! I'v been looking for so long for this scan, thank you so much! Very Nice!. Thank you very much. Lovely.